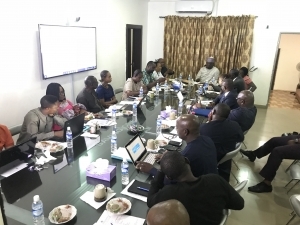 The third National Health Facility Survey Management Committee Meeting began on a high note today as the chairman of the Committee, Dr. Ibrahim Kana informed the meeting that the minister of health and the Statistician General of the Federation have signed the MOU of both the National Health Facility Survey and the 2019 National Nutrition and Health (SMART)Survey. On funding, Dr. Kana reminded members that both Government of Nigeria and Development Partners such as Global Fund, USAID, Bill and Melinda Gates Foundation, and UNICEF are contributing to the survey. He said the two surveys firms bedrock of the SOML as it triggers funds disbursements to the states. He further stated that data generated from the survey can be explored for research by universities. Dr. Jibrin Sulaiman gave update on the survey instruments and said only Malaria Programme provided additional question to be added while expressing support to the document as it were. Mrs. Opeyemi of the World Bank transmitted request from the Global Fund. The survey instrument is expected to be ready in one week. The committee also recieved update from the World Bank regarding the survey consultants who are to assume work in May; in the interim, the World Bank would continue to provide Technical Assistance to the survey. The pilot phase of the 2019 NHFS is scheduled to take place in Keffi, Nasarawa state in April, 2019 as the training of enumerators would be conducted on a zonal basis. The main data collection is expected to commence in May, 2019.